This is the second semester first-year writing course in a two-course sequence focused on writing, rhetoric, analysis, transfer, genre awareness, and research-based writing. 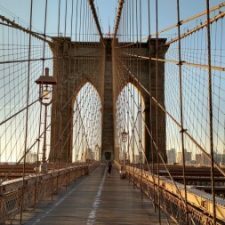 Reading and Writing About New York City This is a writing intensive course designed to strengthen your ability to read critically, and write effectively. Over the course of this term we will study numerous essays, stories, poems, and films related to the history of New York City. Studying these works will help you to develop your own ideas and improve your writing skills. You will write several short essays, and one longer research essay. These projects will help you to develop research writing skills such as building an argument, and mastering the mechanics of quoting, citing, and documenting sources. The main readings from the course will come from The Place Where We Dwell, an excellent anthology with writings about the city of New York from a diverse range of writers in many different genres and disciplines. These readings will be supplemented with film clips, websites, and handouts. It is my hope that this class will help you to develop valuable skills in written communication and research methodology, while also giving you a greater appreciation for the rich history and culture of the city around you. Teresa hasn't created or joined any clubs yet. Teresa hasn't created any friend connections yet.